Learn about six different types of Japan pearls. Japan...home of the "Pearl King," Kokichi Mikimoto ...birthplace of our modern pearl industry ...we have much to thank this country for concerning their work and development of the pearl. Learn more about pearls divers at Toba. Here are some facts about six types of Japan pearls, including: Akoya pearls, Keshi pearls, Biwi pearls, Kasumiga pearls, Mikimoto pearls and Abalone pearls. Thanks to Renee Newman GG for her book, PEARLS BUYING GUIDE, where most of this information was aquired. This book has very striking photographs. You need to see them for yourself. SIDENOTE: A great way to browse through books before buying is to visit Borders Bookstore. Often our family will take a Friday evening and spend it at Borders...looking at books and magazines to our heart's content. Borders encourages this by providing comfy sofas and even a coffee shop. I love this concept. A bookstore owner from a "regular" bookstore once rebuked me for reading out of a book. She said, "This is a bookstore, not a library." I much prefer Border's style. Often the term Japanes pearls is synomous with Akoya pearls, which simply are saltwater pearls from the Akoya oyster (Pinctada fucata martensii) and are usually cultured. I've even heard of akoya pearls in general incorrectly being referred to as "Mikimoto" pearls. 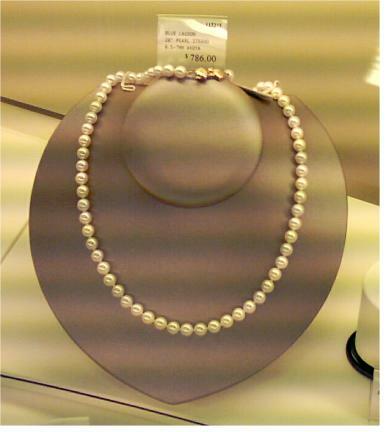 Japan is presently the most abundant producer of Akoya pearls over 7mm which are the most well known saltwater pearls. Korea, Hong Kong and Sri Lanka also produce Akoya pearls, with China being the biggest supplier of Akoya pearls under 7mm. Akoya pearls occur naturally in light pink, white or yellowish color and are typically quite round in shape. Only one pearl and maybe an accidental Keshi pearl is harvested from one oyster. This is one reason why seapearls are usually higher price that freshwater pearls...several freshwater pearls can be grown at a time in each clam. Akoya pearls can also be blue. This occurs when there is a foreign contaminant in the nacre (NAY-ket) or between the nacre and shell bead nucleus. These "mother-of-pearl" bead nuclei usually come from an American clam, by the way. Tennessee and Iowa are both sources for these pigtoe clams. Several are harvested from the Mississippi River here in Muscatine, Iowa, where I live and also from other rivers. Muscatine years ago was the Pearl Button Capital of the World. This term is widely used for a variety of different pearls. Here it will be discussed when its used to refer to pearls from Japan Akoya oysters. One of the uses for this term is for pearls that happen by accident when cultivating Akoya pearls. They form when during implantation of a pearl nucleus microorganisms, shell particles, or detached fragments of mantle tissue also enter the Akoya oyster. Often the oyster builds up nacre around these contaminants and a Keshi pearl is born. Because the Keshi Japan pearl is generally small in size, they are sent out to low labor costing countries so the holes can be drilled out by hand at a lower cost. 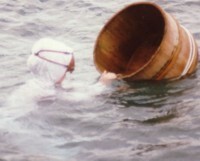 In days on by, Lake Biwi in Japan (its largest lake) produced large quantities of Biwi freshwater cultured pearls. Pollution has now taken its toll on Lake Biwi, which by the way, was one of the world's first cultivation places for freshwater pearls. I was know for its high quality Japan pearls. Unfortunately, the name Biwi Pearl is often misused and attached erroneously to add a greater value to some pearls. Lake Kasumigara, north of Tokyo is the site of cultured pearl producers of Kasumiga and Kasumi pearls from the hybrid mussels called Hyriopsis schlegelii x Hyriopsis cumingii. These pearls are new on the scene of freshwater pearl culture....only since the mid 1990's. These pearls are large, 11-16 mm (large by freshwater pearl standards) because of being started with a larger nucleus. Unlike most freshwater pearls, Kasumi pearls are limited in number. Colors vary from purple to pink to white to golden. Kokichi Mikimoto whose persistence has given the world the gift of affordable, available pearls...although don't expect the Mikimoto pearls to be either...they are the cream of the crop. Even in baroque shape...they cost a pretty penny. Read about my visit to Mikimoto in downtown New York City. Mikimoto is know for many things, the most common thing he's known for, is "for NOT being common," but instead for their superior quality of pearls. However, we're seeing more and more of a variety of price ranges coming also from Mikimoto, such as their Blue Lagoon line which, while not being cheap, is not astronomical either. One thing you can depend on though, Mikimoto jewelry is fantastically lovely and with its signature clasps and certificates of authenticity they undoubtedly retain or even increase in value, making them a wise investment. I have early childhood memories of admiring these beautiful shells. My parents brought one back from California and it was like looking into heaven. Years ago on a trip to the coast in Oregon, my husband's childhood state, he purchased me some hair combs decorated with abalone. They have always been a treasure to me. Abalone is a large snail of genus Haliotis. It's interesting to note that all shells can produce pearls even Abalone and the pearls are just as beautiful as the shells. Some Abalone pearls are found naturally in Japan, California, Oregon, Alaska, Mexico, Korea, South Africa, Australia and New Zealand. (New Zealand Abalone pearls are sometimes called Paua Pearls from the Paua Abalone shell). Wes Rankin estimates the chances of finding a natural Abalone pearl of any size or shape to be about 1 to 50,000. Usually the shape of natural Abalone pearls is baroque and a designer's dream. Abalone pearls can also be "started" by "gluing" a nucleus (no surgery required) to the inside of an Abalone shell. Because normally a half-spherical plastic bead is used, these resulting pearls normally turn out to be Mabe or blister pearls, which are hollowed out, filled in and backed with a hard back before mounting. Whole pearl nuclei have been implanted, but the problem of the abalone's blood not being able to coagulate causes them to bleed to death....hense the half-spherical being glued instead. The iridescent colors range from combinations of green, blue, pink, purple, silver and occasionally creamy white. Blue and pink are most highly prized. As its mother-of-pearl shell, fine Abalone pearls have a metallic like luster. Their rarity brings prices of between $200-$2,000 or higher per carat. The following is a quote from the Japanese Pearl Promotion Society's "Pearl Standard, as read at Mikimoto Pearl Island Museum, Toba, Japan. "Pearls are metabolites found in molluscs. The visible part is composed mostly of substance equivalent to the mollusk nacre irrespective of whether they contain a nucleus made of freshwater mussel shell or materials of the same component and specific gravity." After reading "Japan Pearls" go here to main list of countries where pearls are found.